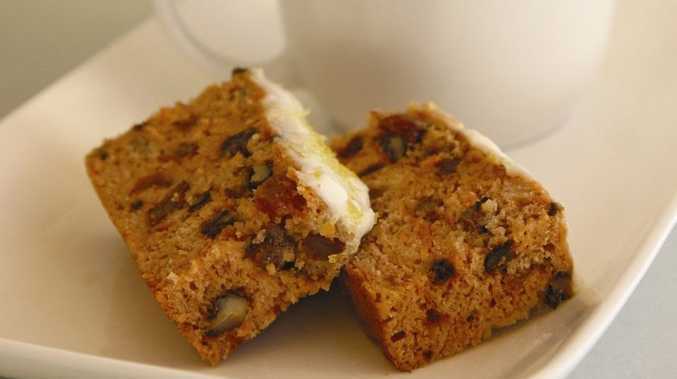 CARROT cake recipe from Annette Sym's Symply Too Good To Be True book one. Preheat oven 180 C fan forced. Beat egg whites and sugar together in medium size mixing bowl for 1 minute. Stir in apple sauce, sultanas, carrots, walnuts, ginger and rind to egg mix, dissolve bicarb in warm water, add to mix. Gently fold flour into mixture in one go. DO NOT BEAT as this will make the cake tough. Once flour is combined (mixture can look a little lumpy) pour into a 19cm (8˝) round tin or loaf tin that has been coated with cooking spray. Bake 35-40 minutes or until cake springs back when lightly pressed in centre. Let cake stand for 5 minutes before turning onto cake rack. To make icing: Mix icing sugar and margarine in a small mixing bowl, slowly add enough juice to make a spreadable consistency. Spread over top of cake. Sprinkle grated lemon rind or a little cinnamon over icing for decoration (optional).